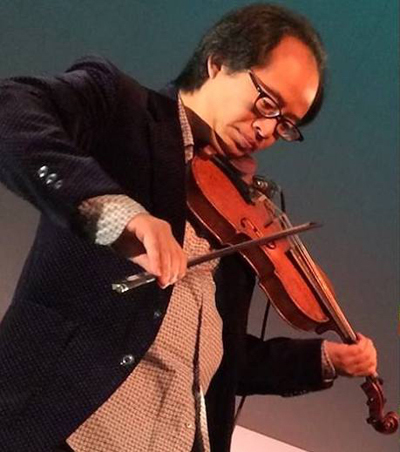 Tom Chiu, founder and leader of the FLUX quartet is having a busy year. At the recent New York City premiere of "RETROCON" at the Bang on a Can festival, a piece composed by Chiu and given a vibrant performance by Flux, there was sense of excitement and expectation. In the 20 years since Chiu founded Flux, their stature in the comtempary Classical World has grown and they have gained a reputation for preforming some of the most challenging pieces of modern music. They are probably best known for their commitment to Morton Feldman's six hour "String Quartet II." However, Chiu told me recently that they are putting it on hold for the remainder of 2018 and possibly longer. Flux have performed this daunting six hour piece (without intermission) to patient audiences all over the world so clearly, Chiu and Flux relish a challenge and are not prone to taking soft options. "I don't want to pay crap. If I was approached to pay crap, it would cost a lot of money" he says jokingly. However, Chiu feels that "at the end of the day, regardless of the genre of what I put into my CD player, I'm listening to music that challenges me and that connects emotionally with me and I want to do the same for my audience". As a Juilliard-trained violinist, Chiu is referring to his affinity for free-jazz, improvisation and the avant-garde. Flux recently collaborated with alto saxophonist, Oliver Lake on the critically acclaimed CD Right Up On. The NY Times selected this recording as one of the best Classical recording of 2017. "When Mr. Lake joins the quartet, his saxophone playing sparks new heights of intensity" it suggests. This recording is the result of a 15 year collaboration and Chiu considers this process time well spent: "sometimes that's what happens with artists, you do need the time and with that time, things get that much more (developed)." Neither Chiu nor Lake see any real distinction between different genres and see nothing unusual in the collaboration. "I don't make a distinction, I would say that there's nothing to bring together. If you say ‘bring together,' you are assuming that the two things are separate." However, Chiu notes "it is unusual for someone of my background to be so interested in music, in genres, in styles that don't, on the surface, appear to overlap... the overlap is just quality and the high level of risk-taking and experimentation That's were the overlap is." Chiu is no stranger to working with jazz musicians. 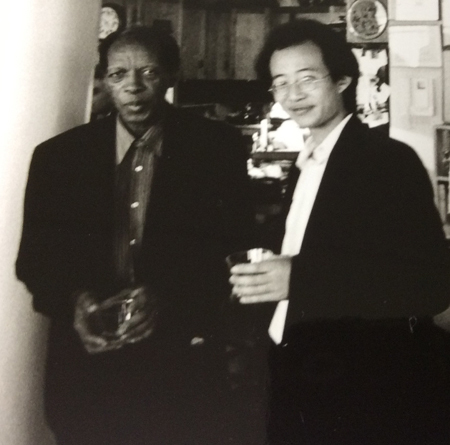 In fact, while still a student at Juilliard, he meet and started to work with the great Ornette Coleman. Coleman was looking for students to work on his composition "La Statue." This lead to Chiu assembling a 20 piece ensemble and serving as concertmaster for a performance of the piece at the Bell Atlantic Jazz Festival in 2000 in Manhattan. Coleman became a mentor and friend to Chiu and had a profound impact on Chiu musical choices and career. "Simply put, I just loved spending time with him. There was a good chunk of time, five to ten years, if I had free time I would go to his house. There was the Bell Atlantic and there was a performance in 2005 at the Walker Arts Center, so there were real things that we worked on. I was playing his solo (violin) piece, called "Trinity," quite a bit and there was a quartet piece "Poets and Writers" that Flux was playing quite a bit, so it was on-going." And as Chiu puts it, "how can you not spend time with someone like that?" Clearly, much of what Chiu relishes is the opportunity to work with living artists and to collorate and improvise with fellow musicians. Even within the confines of Flux, the work is based on all members' personality and intonations. With "RETROCON," Chiu wrote the piece with his fellow members in mind (Conrad Harris- violin; Max Mandel- viola; Felix Fan- cello). Chiu allowed enough space in the composition for the all the member's input and flow to complete the piece. Moreover, this year will also see the release of Chiu's first collection of all original compositions for Phill Niblock famed XI label. Still a work in progress, Chiu is selecting works to present a complete compositional overview for this double CD outing. Niblock, another mentor to Chiu and the New York downtown music scene in general, has been fostering musical talent and innovation for decades and the been associated with so many of the great innovate talents of the last 40 to 50 years. Chiu sees himself as part of this tradition. Flux's name was adapted from the Fluxus art movement and Chiu cites all the radical musical innovators from John Cage onwards as influences. While there will be no performance of Feldman's signature opus this year, Flux will be instead be working on other major projects. This summer, Flux will perform the world premiere of Toshi Ichiyanagi's "String Quartet No. 5." The 85-year-old Japanese composer (perhaps best know as Yoko Ono's first husband) has been a pillar of modern music and Chiu is excited and honored to have been selected to perform the piece at the La Jolla Summer Festival. Flux also have recording of two Conlon Nancarrow String Quartets set for release in the coming months. Again, the penchant for working on difficult and challenging work remains, however Chiu feels "most of the music I like is rather accessible. I think most of the music I play would not alienate people if they gave it a chance." Chiu is also perhaps the only living, conservatory trained violinist to regularly perform with a bagpipe player- in this case, David Watson. This is really the best reflection of Chiu's playful and anarchic personality. While it's certainly outside the standard cannon, who's to say it won't one day grace the stage of Carnegie Hall? Chiu can rightly take this time to reflect on 20 years of Flux and to reconsider their direction and aims. The forthcoming recording recordings and performances will attest to their talent and determination and the next 20 years should be interesting to say the least.